Howdy. Not much going on these days. I have another 3 days off for fall vacation. I have been puttering about the house mostly. 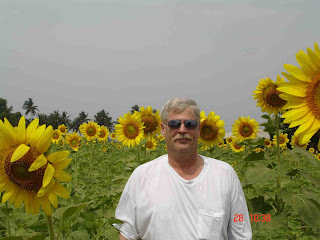 I just wanted to get a few pics of the sunflowers up. They start blooming here at the end of October. The tourists will start coming soon. It lasts for about 2 months. Last year we had too much rain, and the crop wasn't very good. This year looks to be better, but fewer farmers are planting them. There is more money to be made planting sugar cane, well, there was, until EVERYONE started planting sugar cane. 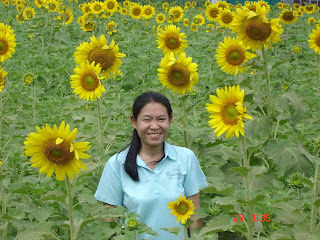 Anyway, here is a few shots of Roong and I in the sunflower fields near our house.